Berdine Creedy 10th Anniversary Collection. Vivie is one of Berdine Creedy's "Butterfly Children". 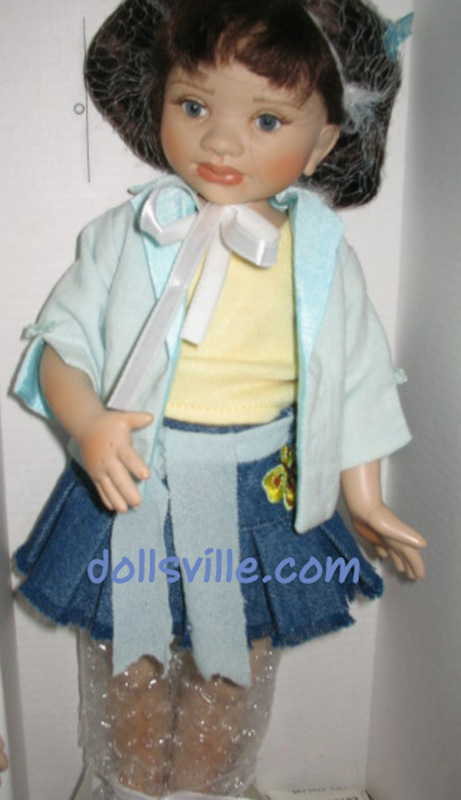 She is a 13" fully jointed vinyl blue-eyed, dark brunette haired doll from Berdine Creedy. Vivie's short blue denim skirt is decorated with a little yellow butterfly motif, to co-ordinate with her sunny yellow Tshirt, and over this is a cuffed pastel blue jacket with ties at her waist. Brand New NRFB MIB New in her original box. Hand-signed certificate by Berdine Creedy is included in her box.